Living in the digital age is tricky. 30 years ago, having a public conversation required physical proximity. Disembodied conversations happen regularly now, with people SHOUTING AT EACH OTHER through the screen. 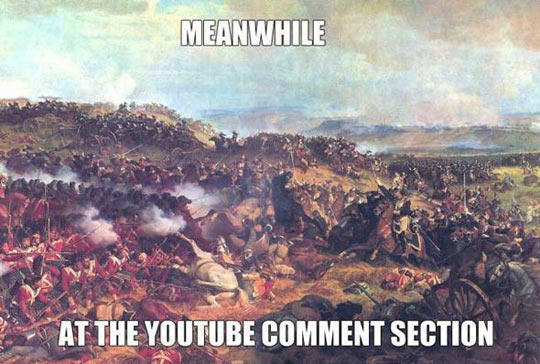 The “comment section” has its own meme (and a special shoutout to YouTube comments). By robbing public conversations of physical presence, we risk turning fellow humans into enemies, personifying everything we dislike about the position they represent. And we wonder why American political rhetoric is so counterproductive. What if we could flip the script on this? What if public disagreement in the world of Facebook, Twitter, or other social media, could become a spiritual discipline? Wait, hear me out! While conversations on social media made in the heat of battle are not usually kind, patient, or empathetic, they point to a particular posture: vulnerability. But vulnerability isn’t unique to online conversations—any time anyone has disagreed in the “public square,” they have risked sharing a piece of their story. So what sets digital disagreement and disagreement that takes place face-to-face apart? Put simply, the assumption of friendship. If I am in physical proximity to a person and express disagreement, the only way we’ll stay in the same space long enough to have a conversation is if we each care about what the other person thinks and believes. By naming the other person as “friend,” we confess that we care about them as a fellow human being. Friendship also has the potential to influence our interactions on social media. But the issue is online interactions aren’t limited to our friends—they involve acquaintances, colleagues, and the occasional elementary school math teacher. And because Facebook lumps all such people together, “friendship” ceases to be so well-defined. So the same friendship that would keep two people talking in person can’t be assumed in a digital conversation. One person might “walk away” digitally by unfriending, unfollowing, ignoring, or otherwise cutting ties with the conversation. But herein lies possibility—an inroad to digital engagement that is rife with intention. We need to understand that relationships on social media are not any more or less real than relationships in “real life.” Especially when we work with young people, whose online personality is more an extension of their self rather than a projection of their self, we need to engage authentically and regularly via the screen. Although this might lead to additional strain on our relationships, we can also demonstrate to our young people (and, occasionally, other “less-young people”) how to disagree in a healthy way. Modeling healthy disagreement with others—particularly those who are only “Facebook friends”—requires seeing the image of God in them. This nurtures spiritual health and fosters spiritual growth to alter existing life and thought patterns. In this way, it is a spiritual discipline. We can change the culture of disagreement by consistently and intentionally wading into the deep waters of disagreement while honoring the image of God in our “opponents.” We can practice the spiritual discipline of disagreement by forcing ourselves to think of our “opponents” as reasonable people whom Jesus loves. What does disagreement look like on social media? Some people say it’s a waste of time: Nobody changes their mind, so why bother? Others say that it is necessary to engage: Silence is complicity, so speak boldly! While there is truth in these competing thoughts, they’re both incomplete. Any disagreement on social media is necessarily a disagreement in the public square. Therefore, choosing to disagree through a screen requires a dual focus. It is necessary to address both the individual with whom we disagree and the audience who is listening. To understand disagreement as a waste of time focuses too much on the individual, but to demand constant engagement focuses too much on the community. Neither is a viable long-term plan since those who disagree with everyone tend to become background noise, while those who never voice disagreements miss critical areas of engagement. Entering into disagreement in the public square will be messy. But messiness isn’t an excuse to avoid digital disagreement. Living and interacting in the public square is messy because people are messy. In fact, disagreeing in public where there’s a written record of the conversation can help to limit this messiness in ways impossible to avoid when interacting in person. For example, anyone joining the conversation can look back through the discussion and trace the argument, which is much harder to do in casual conversation. However, the lack of body language and tone in written conversation can act as an obstacle in written communication. Recognizing this ought to lead us to redouble our efforts to disagree in loving, patient, and clear ways with others, because there’s no such thing as a “throwaway comment” on the Internet. We must also exercise caution to make sure we’re understanding the other person’s argument and giving it a fair hearing. What about social media users who don’t want their words to be taken out of context? While this concern is understandable, I’d like to suggest that it shouldn’t ultimately dictate our digital and public interactions. I’d argue that touchy issues are exactly the issues that the church needs to speak to—if we avoid dealing with issues involving risk, then we’ve effectively sidestepped any interactions of weight. And if we always avoid weighty conversations, how can we presume to share the good news of Jesus Christ? Public interactions of any kind can be misinterpreted; this isn’t unique to social media. Getting our wires crossed and miscommunicating is part of what it means to be human—and this is true even in private interactions! No matter how hard I try, I cannot control how others interpret what I say. However, when we interact on social media, there is a public record of the conversation. If we consistently disagree in ways that are charitable to the other person and their perspective, that often communicates our faith more than the position we take—especially when the conversation has gravity. While there are many reasons to avoid forays into digital, public square disagreement, we stand to gain immeasurably by practicing the spiritual discipline of healthy disagreement. As the church, we are committed to seeing God in all whom we meet, whether online or offline. Instead of fearing digital, public engagement, let us embrace it. It gives us an opportunity to learn from others and show them we’re able to disagree while loving them anyway.